"Capital of China" redirects here. For the capital of the Republic of China, see Taipei. For the capital of the People's Republic of China, see Beijing. There are traditionally four historical capitals of China, collectively referred to as the "Four Great Ancient Capitals of China" (中国四大古都; 中國四大古都; Zhōngguó Sì Dà Gǔ Dū). The four are Beijing, Nanjing, Luoyang and Xi'an (Chang'an). Acheng District of the city of Harbin was the capital of the Jin dynasty from 1115 to 1153. It was called Shangjing (上京; Shàngjīng; 'Upper Capital') or Huining Prefecture at the time. It was destroyed in 1157 and reestablished as a secondary capital in 1173. Anyang was the capital of the Shang dynasty (1600 BC – 1046 BC) at its peak. It was called Yin (殷; Yīn). The state of Yan (11th century BC – 222 BC) in the Zhou Dynasty, when it was called Ji (蓟; 薊; Jì). 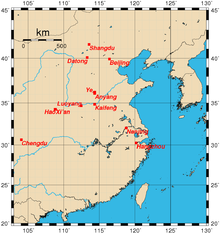 The short-lived regional kingdom of Yan (911-914) established by Liu Shouguang during Five Dynasties period. The Jurchen Jin dynasty, from the 1160s to 1215, when it was called Zhongdu ("Central Capital"). The Yuan dynasty (1271–1368), when it was called Dadu (大都; Dàdū; 'Great Capital') in Chinese, Daidu (direct translation from Chinese) in Mongolian, and Khanbaliq ("city of the Khan") in the Turkic languages. Marco Polo called it Cambuluc. The Ming dynasty, from 1403 to 1644, when it was called Shuntian Prefecture (顺天府; 順天府; Shùntiān Fǔ) and then later simply as Jingshi (京师; 京師; Jīngshī; 'Capital'). The Qing dynasty, from 1644 to 1912. The Beiyang government of the Republic of China, from 1912 to 1927. The capital of the People's Republic of China since 1949. Changchun or (Japanese: Shinkyō, Mandarin: Xīnjīng, literally New Capital) was the capital of Manchuria during the Japanese occupation in WWII, then named Manchukuo. It was also briefly the seat of the Nationalist government of the Republic of China in late 1949 towards the end of the Chinese Civil War. Chongqing (also romanised Chungking) was the capital city of Ba State during Warring States period. Ming Yuzhen, the rebellion leader during the transition time between Yuan and Ming dynasties, established the Xia kingdom and set the capital city in Chongqing. Chongqing was also the provisional capital of the Nationalist government of the Republic of China during the Second Sino-Japanese War (1937–1945), and briefly the seat of the Nationalist government in late 1949 towards the end of the Chinese Civil War. Datong was the capital of the Northern Wei dynasty from AD 398 to 493. The Nanyue Kingdom (204–111 BC). More specifically, the Nanyue capital was in Guangzhou's Panyu District. The Nationalist government of the Republic of China, before 1928, and in 1949 towards the end of the Chinese Civil War. The Wuyue Kingdom (907–978) during the Five Dynasties and Ten Kingdoms period. The Southern Song dynasty, from 1127 to 1276, when it was called Lin'an (临安; 臨安; Lín'ān). Fenghao, located near present-day Xi'an, was the capital of the Western Zhou dynasty from 1046 BC to 771 BC. The Later Liang dynasty during the Five Dynasties and Ten Kingdoms period, from AD 913 to 923. The Later Jin dynasty during the Five Dynasties and Ten Kingdoms period, in AD 937. The Later Han dynasty (AD 947–951) during the Five Dynasties and Ten Kingdoms period. The Later Zhou dynasty (AD 951–960) during the Five Dynasties and Ten Kingdoms period. The Northern Song dynasty (960–1127), when it was called Bianjing (汴京; Biànjīng). The Eastern Zhou dynasty, from 510 BC to 314 BC. The Eastern Han dynasty from AD 25 to 190 and then briefly in AD 196. The state of Cao Wei (AD 220–265) during the Three Kingdoms period. The Western Jin dynasty, from AD 265 to 311. The Northern Wei dynasty from AD 493 to 534. Wu Zetian's Zhou dynasty from AD 690 to 705. The Later Tang dynasty during the Five Dynasties and Ten Kingdoms period, from AD 923 to 936. The Later Liang dynasty during the Five Dynasties and Ten Kingdoms period, from AD 907 to 913. Eastern Wu during the Three Kingdoms period, from AD 229 to 265, and then from AD 266 to 280. Eastern Jin dynasty, from AD 317 to 420. Liang dynasty, from AD 502 to 552, and then from AD 555 to 557. The Taiping Heavenly Kingdom (1851–1864) during the Taiping Rebellion in the Qing dynasty, when it was called Tianjing (天京; Tiānjīng; 'Heavenly Capital'). The Nationalist government of the Republic of China from 1928 to 1949, and then de jure from 1949 to 1991. The Reorganised National Government of the Republic of China (1940–1945), a pro-Japanese collaborationist government headed by Wang Jingwei during the Second Sino-Japanese War. Taipei in Taiwan has been the de facto capital of the Republic of China since 1949. Wuhan was the capital of a government formed by Wang Jingwei and leftist members of the Kuomintang in 1927. It opposed the Nationalist government led by Kuomintang leader Chiang Kai-shek. Xanadu/Shangdu (上都; Shàngdū; 'Upper Capital'), located northwest of present-day Dolon Nor in Inner Mongolia, was the summer capital of the Yuan dynasty. It was destroyed in 1369. The Western Zhou dynasty, from around 1046 BC to 771 BC. See also Fenghao. The state of Qin (9th century BC – 221 BC) and the Qin dynasty (221–206 BC). The Qin capital, called Xianyang (simplified Chinese: 咸阳; traditional Chinese: 咸陽; pinyin: Xiányáng), was located near present-day Xi'an. It was destroyed in 206 BC. The Western Han dynasty, from 206 BC to AD 9. The Eastern Han dynasty, from AD 190 to 195. The Western Jin dynasty, from AD 312 to 316. The state of Former Zhao during the Sixteen Kingdoms period, from AD 318 to 329. The State of Former Qin during the Sixteen Kingdoms period, from AD 351 to 385. The State of Later Qin during the Sixteen Kingdoms period, from AD 384 to 417. The Sui dynasty, from AD 581 to 605. The Tang dynasty, from AD 618 to 684, and then from AD 705 to 904. Ye, located within the present-day city of Handan, was one of secondary capital cities of Cao Wei (220-265), and the capital city of several regional kingdoms during Eastern Jin period: Later Zhao (319-351), Ran Wei (350-352) and Former Yan (337-370). It was also the capital city of two major dynasties in Southern and Northern dynasties period: Eastern Wei dynasty (534-550), and the Northern Qi dynasty (550–577). Yinchuan was the capital of the Western Xia from 1038 to 1227, when it was called Xingqing (simplified Chinese: 兴庆; traditional Chinese: 興慶; pinyin: Xīngqìng). Zhaoge was the secondary capital city during last years of Shang dynasty when it was ruled by King Zhou. Later, it was the capital city of Wey during the Eastern Zhou period. 楊州 1129–1130 Flight of Emperor Gaozong during the Jin invasion of the Yangtze Delta in 1129–1130. 福州 1276–1277 Flight of Emperor Duanzong along the southeast coast following the fall of Lin'an in 1276. ^ a b Bamboo annals Xia chapter on Xia Jie under the name Gui (癸). ^ a b c d Esherick, Joseph. (2000). Remaking the Chinese City: Modernity and National Identity, 1900-1950. University of Hawaii Press. ISBN 0-8248-2518-7.